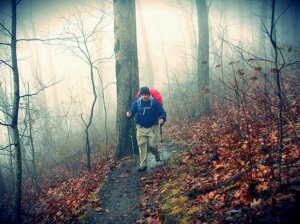 Christopher Davis hikes the Appalachian Trail. photo provided. Christopher Davis’ dream was to one day hike the Appalachian Trail to bring awareness to a cause closest to his heart — returning veterans. To do on someone’s time clock would be an unexpected treat. Davis made a pitch about a year ago to his new boss, Bob Rosinsky, president and CEO of Goodwill Manasota. Davis proposed his “good cause” would shine light on the issue of military veterans coming home and having trouble accessing services. Rosinsky immediately said “yes” even though it meant Davis would be physically out of pocket for five months, hiking with a backpack between Mount Katahdin, Maine, and Springer Mountain, Ga., while remaining on the payroll. As it turns out, the story of Davis’ May 28-to-Thanksgiving trek and why Rosinsky said yes is as much about Rosinsky and his enthusiasm and passion for military veterans as it is about his bucket list adventure. Davis, 35, was hired by Rosinsky in January 2013 to be the veteran’s program manager for Goodwill Manasota’s new American Veterans and Their Families Initiative. It helped 329 veterans find jobs in 2013, according to Goodwill Manasota records. But Rosinsky said he wanted to go beyond just landing jobs for veterans. Working with an annual budget of roughly $100,000, Davis helps veterans and their families when they are down and out. Program funding comes from grants and sales of donated items. Rosinsky said Davis has done a stellar job. “People have visited and said that our program has gotten more traction than other vet programs they are aware of,” Rosinsky said. “I believe the progress we are making is due to Chris. It’s hard to imagine a CEO giving the green light to a key employee to hike the Appalachian Trail for five months, but Rosinsky is more than OK with it. While Davis is gone, his assistant, Don Hill, will run the program, Rosinsky said. 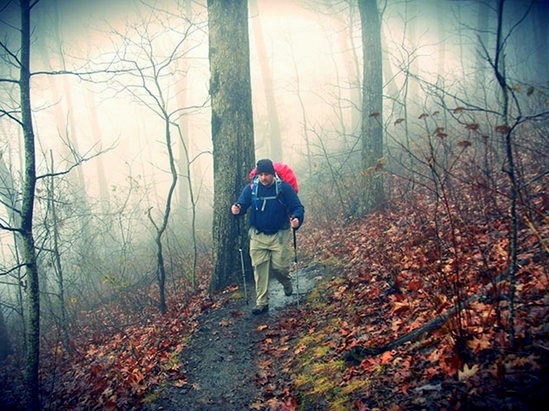 Davis said he thinks the Appalachian Trail will be symbolic for veterans. Davis can thank the late Guy Kelnhofer of Wisconsin for making his Appalachian trek a reality. Kelnhofer, Rosinsky’s uncle, was captured in Wake Island during World War II and spent four years in a prisoner-of-war camp. “I saw some of the issues he had coming back,” Rosinsky said. Rosinsky noted veterans like his uncle don’t always get needed services but it’s not because the services are not available. Manatee County has 36,000 veterans, Davis said. “The 2011 census reported 81,000 veterans in Manatee, Sarasota, DeSoto and Hardee counties,” Davis said. “Manatee is definitely in the top three of Florida’s counties for number of vets. “There are young vets as well,” Davis added. Davis recalled a recent case where he helped a vet access a Veteran’s Administration housing program for chronically homeless vets. “The sky is the limit when it comes to what we can do to put vets back on track,” Davis said. Goodwill Manasota will be getting a lot of value out of Davis’ trek, Rosinsky said. Rosinsky plans to meet Davis at Harper’s Ferry, W. Va., in August and walk about 100 miles over a week. Davis is also fundraising. People can donate from five cents to $1 per mile at experiencegoodwill.org, which will have links on the home page, Reed said. “Whether he raises $2,000, $10,000 or $50,000 for his program is inconsequential when you look at the impact of raising awareness over that longer period of time,” Rosinsky said. Richard Dymond, Herald reporter, can be reached at 941-745-7072 or contact him via Twitter @ RichardDymond.